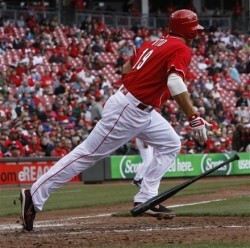 The Reds avoided a series sweep at the hands of the Cardinals this afternoon by eking out a last minute win, 3-4. Johnny Cueto took the mound for the Reds and added to his reputation of awesomeness. He allowed three runs (earned) on seven hits in seven innings. He also struck out three. Jose Arredondo, Bill Bray, and Logan Ondrusek took their scoreless turns, but it was Aroldis Chapman who really brought it all home, with his five strike-outs in two innings. Firey! Joey Votto, Jay Bruce, Chris Heisey, and Wilson Valdez had an RBI apiece. Votto, in fact, went 4-for-5 with two runs scored. Tomorrow the Reds play a rare second day game in a row as they visit the Washington Nationals. Mat Latos takes on Gio Gonzalez at 1:05 p.m. You can catch it on Fox Sports Ohio and MLB Network. Posted in Cincinnati Reds, Game Wrap, St. Louis Cardinals.